Andrei Rublev (1360-1430) is the supreme Russian iconographer , the Russian Orthodox Church proclaimed him a saint. The icon of the Trinity, painted between 1422 and 1427 and now kept in the Tretyakov Museum in Moscow, is universally considered a masterpiece, both artistically and theologically. As stated by Daniel Rousseau " this icon is not intended to represent concretely the three persons of the Holy Trinity. How could it, since the divinity can not be represented by its nature? " 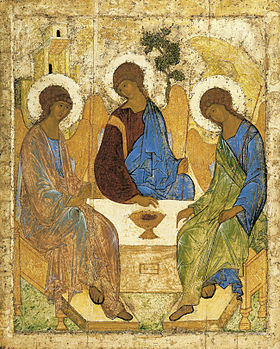 The subject of the icon of the Trinity, which incorporates the iconography of the famous prototype of Rublev, is based on the story of "Hospitality of Abraham " (Genesis 18), which tells of the meeting held at the oaks of Mamre, including Abraham, founder of the chosen people, and three pilgrims, which the Bible calls " angels " . During this meeting the three announced the birth of the son Isaac to the patriarch. From the ninth century in the eastern liturgical texts the episode is considered the appearance to Abraham of the Holy Trinity. The time shown in the icon is one in which the three " men " are sitting at the table. They are messengers, ie the angels of the Lord, are therefore depicted with wings, as dictated by the traditional iconography. Other elements that link the text of Genesis, to the image under the tent of Abraham represented by a building (or temple) and a tree, the oak . In addition there is the element of the mountain, probably for both a requirement of the composition , and for its value as a symbolic place. On these elements Rublev weaves a subtle web of symbolic evocations , who received multiple interpretations . The symbolism, typical of traditional iconography, is based on the circle - communion : the three figures are set in a harmonious conversation that is expressed with looks and gestures that converge on the table , the symbol of the Incarnation and the Eucharist . (the latter is the order in which they are appointed in the Creed) . The common divine nature of the three is underlined by: faces and youthful figures and indentical, halos all the same, the color blue (divine color) and the scepter (the sign of the same authority). In the West today there is a growing interest in the " icons " , from the greek eikon, meaning " image " . It ' a kind of a religious painting on wood panel that was born and developed in the East in a greek - Byzantine - Slavic and Russian environment in the fourth and fifth centuries to the time when the Christian art was widely traded. Icons, initially large format, were destined to churches and used in processions . When it appeared in a reduced size (portable icons) became increasingly sought after as religious signs to keep in the home .Many monks and saints who prayed painting icons and among these the bigger is the Russian Andrei Rublev. Little is known of his life : he was born in Moscow around 1370 and was a student and then assistant of Theophanes the Greek (another great author of sacred images). Became monk in the Andronikov Monastery in Moscow where he spent most of his life and died there in 1430. Rublev was canonized in 1988 for the millennium of the Baptism of Russia, but his reputation of holiness was recognised through the centuries along with its famous representations. His best known work, the icon of the Holy Trinity appeared in all its splendor towards 1909 after careful restoration to avoid obscuring soot produced by lamps and incense. Rublev 's masterpiece is one of the " images " the oldest of the Trinitarian mystery and the Council of the Hundred Chapters of Moscow 1551 declared its canonical Trinity and established that iconographers had to take example from that work. The Russian monk, accustomed to the contemplation of " heavenly things ," transfused in his works a deep religious spirit that inspired him and expressed through a painting remarkably sensitive and fluid, very delicate and harmonious colors . How did the monk-artist spoken of the mystery of God with the image ? From the Gospel of John 1: 18 we read : " No one has ever seen God : the only Son, who is the same as God and is at the Father's side, he has made him known." Writes St. John of Damascus (675-749), the great theologian who defended the use of the images during the iconoclastic crisis : " God has neither body nor form, could not be represented in any way. But today was made flesh, and has lived among men, it can represent the visible God ". The three divine persons, then, only Jesus Christ incarnate, is representable . And , from the facts, the artists did not hesitate to transpose images also the " central mystery of faith and Christian life ", using the symbolism of lines, geometric shapes, colors, positions of the body, head , attitudes of the face, the hand gestures, drawing elements from nature and from human experience. What Scripture teaches us with words it is presented in this icon, where every detail is not left to the imagination of the artist, but has a precise and universal theological significance . Let us come close to the icon and observe carefully, keeping in mind the wealth of symbols used by the painter to emphasize the common nature of the divine Three and Their identities. They are portrayed as angels with wings, Their faces are equal and no one is younger or older than the other: in God there is not a before and after, but a perennial today. All three are holding the cane of the traveler, sign the same authority; Also the halos, bright yellow, all three are equal without any sign of distinction and even the blue, divine color, is in all three figures who are sitting on equal thrones, sign of dignity. Despite the similarity, the angels have different identities related to their action in the world. The identification is suggested by the colors of the clothes, from the positions of the bodies, the hand gestures, the head, the symbolism of geometric shapes. The attitude of the three divine persons, arranged in a circle open to the beholder and in conversation between Them, expresses the love of the Trinity: the angel in the center with the red tunic - purple, the color of love that gives itself up to sacrifice, has the blue cloak that leaves uncovered a shoulder is the Son, central figure of Redemption, is taken at a time when returns within the Trinity. Two fingers of his right hand resting on the table reveal the dual nature: human and divine. The angel of the right seems about to get on the way and depicts the Holy Spirit who is about to begin his mission is wearing a green coat, a sign of hope. It has an attitude of total availability and consent to the other two figures. Both have their faces turned towards the Father, who sent them. And ' He is the starting point of the image. The coat has regal colors: gold and pink with shades of green, symbol of life . At the center of the bright table is a chalice-cup with the lamb inside. If you look closely at the picture, the central angel (Son) is contained in the cup formed by the inner contours of the other two angels (the Father and the Spirit). The cup, the point of convergence of the three - said Filaret, Metropolitan of Moscow, in a homily in 1816 - contains the mystery of the love of the Father who crucifies, the love of the crucified Son, the love of the Spirit triumphs with the strength of the cross . "